Unless you have been in a cave, you know that there is widespread unrest after the Iranian presidential election. Crowds of protestors insist that the election was a fraud, and that President Mahmoud Ahmadinejad had not won re-election. I asked former President George W. Bush what he thought of events there, and his comments took me completely by surprise. "Here in America, people don't riot over a rigged election. We have them all the time! Most people know that elections are just a show like pro rasslin'. That is why so many don't even vote. Hell, I have never once been legitimately elected to public office, but it is no big deal. There is a ruling class, and a following class. It is decided which one you are part of when you are born most of the time." "They just don't get it over there in the Far East. When the slightest thing goes wrong, those moozlim ayrabs are out in the street hooting and hollering just like a bunch of wild Indians. It's about time the army and police beat some sense into them, and bring back some law and order like that general guy did in Pakistan. Ayatollah Khomeini has already warned them that they are going to get their butts handed to them if they don't knock it off, but they aren't listening. He may have to go all Chinese on them." 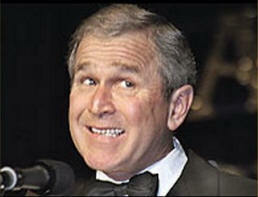 I asked the former President if he was joking, and he said, "Do I look like I'm joking?" It was hard to tell if he was or not. Maybe it was deadpan delivery, but he is not British, so why would he be trying to do British humor? While Bush's comments were a shock, at least they weren't the wishy-washy non-comments that President Obama has been making.